The remit of this thesis is to contextualise violence and martial culture in the Mycenaean world in order to understand how it is a source of legitimacy for political power during MH III-LH IIIB. A theoretical understanding of the way violence shapes cultural conceptions of space and time supports this research, which is implemented methodologically by a deconstruction of the loci in which violence and martial culture are consumed in order to understand culturally specific meanings and codes of practice. In part, this approach was implemented by a decision to weight the efforts to which the Mycenaeans differentiate martial culture over relying on typological methods to amalgamate. 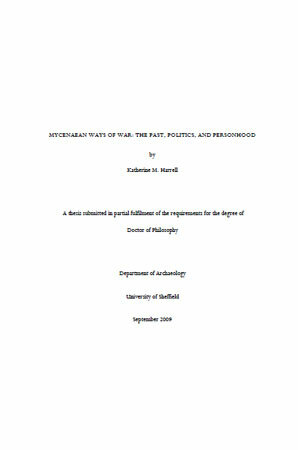 Based on a contextualisation of the martial data from the Shaft Graves, this thesis argues that violence is exploited at Mycenae in MH III-LH I in order to form a complex social hierarchy that relies on the act of witnessing and approving of violence and the tuition of bellicose practices for assimilation. The large numbers of swords deposited in the later graves in Grave Circle B and Grave Circle A are argued to reflect hegemonic integration rather than bilateral segregation of “elites” and “non-elites”. Through LH II there is general dispersion of the consumption of martial culture throughout the Mycenaean world. In this context, death, violence and time are all heterarchical forces that are empowered but also dominated as part of extended funerary rites. Personal honour, orality and bellicosity are understood as mutually reinforcing cultural expressions. By LH IIIA, the threat of violence becomes more associated with liminal places in the embedded landscape rather than with liminal periods of transition, namely death. The metamorphosis is due in part to the presence of historical tombs as a critical element of the political geography but also to the social pressures that proceed to rewrite concepts of proximity during the Late Bronze Age. The Mycenaean response to this is to reaffirm the importance of autochthony and homecoming by building settlement areas and empowering them through confrontations with the threatening landscape. As these processes intensify in LH IIIB, the palaces seek to legitimise themselves as loci of production and consumption. In so doing, they co-opt and reinvent forms of violence, including sacrificial and numinous acts, such as the funeral feast, that had hitherto been primary components of the mortuary programme.